I’ve often been conflicted when I release a pattern for summer in Australia, as it will be winter in the USA and all my American customers will be wondering why I’m putting out a bikini pattern when they’re all snuggled up inside beside the fire. 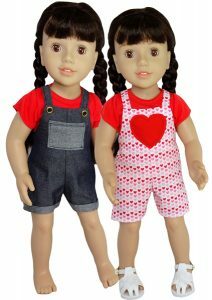 So today I’m so excited to be releasing my new Overalls for All Seasons pattern for 18 inch and American Girl dolls. Because it has options to make the overalls either short or long and from cooler cotton or warmer pinwale corduroy, making them perfect ‘For All Seasons’! 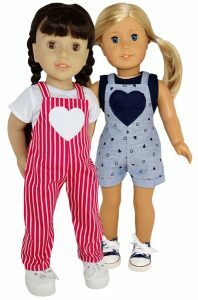 Although these overalls are designed for the 18 inch dolls such as American Girl and Our Generation, there’s cutting lines for the taller Australian Girl dolls too. I’ve also included options to make the hem plain or add some interest with a cuff on either the short or long overalls. I especially love to see the contrasting colour of the cuff if your fabric has a definite contrast on the reverse side. My favourite feature is the super cute heart shaped pocket. What little girl doesn’t love hearts? But if you prefer your overalls to be more traditional, then there is the option to have a rectangular pocket too. And you can change the look by using a contrasting fabric for the pocket whatever shape you choose to do. The back of the overall has cross over straps and an elastic waist for flexibility. I always make my patterns with flexibility of sizing in mind as I know dolls come in all shapes and sizes. I’ve also included some additional sewing tips in my step-by-step videos that may come in handy when doing your everyday sewing of thick fabric or small pieces. Click here to get your 18 inch and American Girl size ‘Overall for All Seasons’ pattern and start sewing today. For everyone wanting the Cabbage Patch size pattern, I’m working on it now so I’ll be releasing it soon.